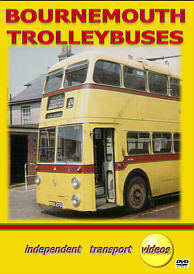 The year 2009 marks the 40th Anniversary since the closure of the Bournemouth Corporation Transport trolleybus system. We have pleasure presenting to you a short cine film taken by renowned transport photographer Alan B. Cross. Alan filmed the system during its final days in the spring of 1969, as well as the last day, 20th April 1969. The famous turntable at Christchurch is featured as well as a number of ‘visiting’ preserved Bournemouth trolleybuses. These vehicles can be seen traversing Tuckton Bridge as well as the Square and many other locations. There is also a ride on the rare open top trolleybus 202 (ALJ 986) a 1935 Sunbeam MS2 with Park Royal bodywork. Plenty of nostalgia for you to enjoy. Moving on to the present. We feature 202 at its ‘new’ home, the East Anglia Transport Museum, Carlton Coalville, Suffolk during 2007. This superb museum has a section of wires so trolleybuses can run ‘in service’ for people to enjoy the atmosphere of a bygone age. The excellent Trolleybus Museum at Sandtoft in South Yorkshire is our next location. Firstly we catch up with preserved Bournemouth Trolleybus 99 (ALJ 973), also a Sunbeam MS2 with Park Royal H56D bodywork. This vehicle still has the original advertisements featuring the entertainment that Bournemouth had to offer in the 1960’s and is maintained to a very high standard by the museum. On Saturday 26th May 2007 Bournemouth 297 (297 LJ) a 1962 Sunbeam MF2B with Weyman H65D bodywork was launched at Sandtoft after an extensive refurbishment. Our cameras were there to record the launch. We filmed this immaculately turned out vehicle around the museum’s road system at Sandtoft. There is also a ride for you to enjoy and recall the days of these silent vehicles. So come with us and celebrate the Bournemouth Trolleybus.